I love tandoori chicken and I'm lucky enough to have a South Asian community in Chicago. I can find all of my spices there. Even though you might not be able some of the spices, you can definitely order them on the internet. Do you like Indian (South Asian) food? Is it too spicy for you? Have you ever made any South Asian dishes? 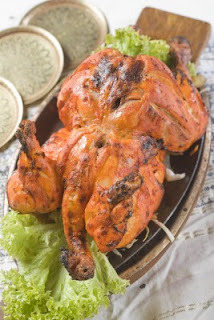 I love tandoori chicken, yum! I haven't ever even tried Indian food. I am allergic to a lot of things so I have always been afraid to try it. I do like spicy though I may have to be brave and try it some day. This sounds really good, but chicken is always good no matter how you cook it. I have never met a chicken I didn't like. I'm not that familiar with this cuisine or the spices. It sounds delish! This recipe sounds like a good one to try for starting out, and it looks wonderful!! !